The Green Party advocates a fair tax system based upon principles of social equity and ecological sustainability that avoids special-interest breaks and asks taxpayers to contribute to the cost of public services based on their ability to pay. Under such a system, a greater percentage of the extreme wealth concentrated at the top of the economy would be taxed and shared with the rest of society to pay for public services. The purchasing power of the overwhelming majority of the rest of Californians would grow at the same time, promoting increased economic development within an ecological context and further increasing public revenues while reducing externalized private costs. Too often this is the opposite of what occurs in California, as the tax code unduly favors corporate special interests and the wealthiest individuals. The result is that over the last decade and more, California has faced massive budget deficits and sustained billions of dollars in drastic cuts to our most valuable resources: our public schools and universities, state parks and beaches, the health care system, and basic safety-net programs that protect the most vulnerable Californians — our children, the elderly and the disabled. Furthermore, California’s overall tax system is regressive and puts the burden of paying for public services upon those least able to pay, while favoring corporate special interests and the rich, such that individual working people are paying more of the tax burden while the wealthiest individuals are paying less. This overall regressivity comes from the relatively large share of income that lower-income households pay in the form of sales and excise taxes. While higher-income households pay a larger share of their incomes in personal income taxes, they can deduct these amounts from their federal income taxes, significantly reducing the total amount of taxes that they pay. As a result, even with higher income tax rates, Californians in the 80-95% highest income bracket pay 7.4 percent of their incomes on state and local taxes, while the bottom 20% pay 10.6 percent - almost 40% greater. The regressivity of California’s tax system also reflects the fact that low- and middle-income households spend all, or nearly all, of their incomes on necessities, including many goods that are subject to tax. Sales and excise taxes are generally not deductible for federal tax purposes. This exacerbates the disparities between low- and middle-income households and high-income households. Then comes how we tax property. 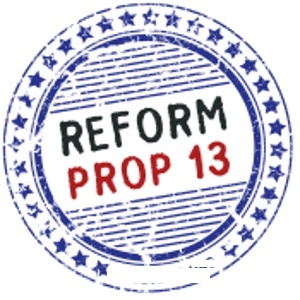 Without a doubt, Proposition 13, passed by voters in 1978, is a major part of the problem and deserves special attention and reform. While Proposition 13 provided much-needed property tax security and relief for many California homeowners, it also instituted a vastly unequal system of tax loopholes for many commercial property owners, including some of the richest corporations in the world. California loses an estimated $8 to $10 billion every year in commercial property tax revenues – monies that could help hire more teachers for classrooms, more police and fire protection, expand our libraries and more. The Green Party would close this commercial property loophole through enactment of a 'split roll' that would ensure that commercial properties are assessed regularly -- and then go further to institute a property tax system that captures the socially-created wealth of land for society, while simultaneously rewarding individual investment and initiative of property owners. This would provide a more stable and progressive base to California's tax system, instead of the current over-reliance upon regressive sales and excise taxes and unstable income taxes. Proposition 13 also instituted a requirement that most tax increases need a two-thirds vote from the legislature or voters. This has made it extremely difficult to generate new revenues for the state treasury, leaving drastic budget cuts as the only alternative. This has led to a wide range of band-aid solutions, for instance, raising debt, regressive taxes and piecemeal budgeting. These have not fixed the problem, but have further complicated California’s budget woes. • Graduated progressive tax rates on California individuals and corporations. • Eliminating corporate welfare in the tax code, including eliminating tax loopholes and subsidies for the oil, gas, coal, nuclear, timber and mining industries. • A Green Tax Shift from taxing people and work (via income and payroll taxes) to taxing natural resource extraction, use, waste and pollution. By cutting income taxes for the average worker and payroll taxes for small businesses, we reward work. By taxing natural resource extraction and use, we promote a healthy environment, penalize pollution and waste, and keep unearned profit out of speculation and monopolies. • A system of carbon taxes on all fossil fuels to begin to reflect the real environmental cost of their extraction and use. Carbon taxes should be applied as far upstream as possible, preferably when possession of the carbon-bearing fuel passes from extraction (for example, coal mine; oil wellhead or tanker; gas wellhead) to the next entity in the supply chain (for example, coal shipper or utility; oil refiner or importer; natural gas pipeline). Offset potential regressivity for lower income individuals via the Green Tax shift that lowers income taxes and/or through other approaches. • A system of True Cost Pricing (TCP) for goods and services. TCP is an accounting and pricing system that includes environmental costs in the price of a product or services. TCP charges extractive and productive industries for the immediate or prolonged damage to the environment and diminishment of natural resources caused by their acts. • Reform of our property tax system to enact a “split roll” system to ensure that commercial properties are regularly assessed to reflect their current value. • Reform of our property tax system to enact a system of Land Value Taxation that distinguishes between the socially and privately created wealth of land. By increasing taxes on the socially created value of land, we retain for society the value that it collectively creates. By lowering taxes on the privatively created value of land, we reward individuals for their work and initiative. • Eliminating the 2/3 vote requirement to raise most taxes and replacing it with a simple majority vote.